Dispatched on a high-priority search-and-rescue mission, Mack Bolan becomes a moving target in the cold heart of Siberia. He's on a motorcycle hell ride along a thousand miles of broken, battered highway. Known as the Road of Bones, it's a mass grave to thousands of slave laborers buried during Stalin's iron rule. A defecting Russian intelligence agent's testimony stands to aim heavy artillery at Russian mobsters in America. To silence her, a hunter-killer team of secret police and gangsters engage in hot pursuit. The enemy has the edge: manpower, weapons and homefield advantage. 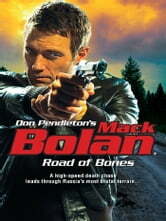 For Bolan, it's a one-way trip on an open road effectively sealed at both ends by death squads. Every mile survived brings them both either closer to freedom…or ultimate doom.